6 June – Malaysian graphic designer Fahmi Reza, known for his anti-establishment artwork, was charged in Sessions Court today for posting a caricature of Prime Minister Najib Razak depicted as a clown online. 28 March – A Malaysian designer’s caricatures of the scandal-plagued prime minister as a sinister clown have become a viral phenomenon, spurring a wider protest-through-images movement and making the artist a target of authorities. The parodies of Prime Minister Najib Razak have rapidly become Malaysia’s most controversial images, earning designer and activist Fahmi Reza comparisons to street-art provocateurs like Banksy. Shared widely on social media, they have sparked copycat variations and struck a chord with Malaysians outraged by corruption allegations levelled at Najib and his moves to thwart investigations. But Malaysian authorities are not amused. Fahmi, 38, who has been arrested previously for his activism, was questioned by police and told to stop posting the images, which show Najib in powder-white clown make-up, with evilly arched eyebrows and a garish blood-red mouth. He said police were investigating possible violations of multimedia laws that could bring five years in prison. 14 Sept – Amid the dilapidated shophouses of former tin-mining town of Ampang, one building stands out – its walls painted deep black and bold red, filled with graffiti, while the signboard hanging above is covered in black paint. On the red and black wall is a drawing of two boys shaking hands. One sports a spiky hairdo, spikes on a black jacket and gloves; the other more conventionally dressed in a hoody. Pulling open the shophouse’s metal shutters reveals a black brick wall with six “no’s” painted on it in bold white letters – No racism, no sexism, no homophobia, no drugs, no alcohol, and no violence. Walk through the wooden door to the left, and one would find a small stage and space for an audience of 300. Since all of the musical instruments have been confiscated by the police last month, the stage lies empty. To the left and to the right of this room are walls filled with graffiti – an explosion of colours that is muted by the counterculture atmosphere of this dimly lit room. This is the place run by a group of punks as a performance space. Welcome to ‘Rumah Api’. On Aug 28, the eve of the Bersih 4 rally, police surrounded this shophouse, and arrested and detained more than a hundred revellers for more than 60 hours. It was only then that this place known only to those in the scene, was thrown into the limelight. Since 2006, Rumah Api has been an important venue for the local punk and underground rock scene. But to the co-operators of Rumah Api, Man Beranak and Ashed, it is more like a community space for the punks. “Rumah Api is not just a place for music, it is a place to promote punk ideology and attitude. “Here, our interests go beyond music,” Man said softly, as he spoke to Malaysiakini during an interview in a smoke-filled living room upstairs. The idea behind Rumah Api is to promote punk culture to mainstream society in hopes of changing society’s negative views towards the subculture. The 35-year old Man (photo) is a veteran in the community, and looks after the place on a full-time basis. He lives upstairs from Rumah Api together with his wife. The area where Rumah Api is located is predominantly ethnic Chinese while the adjacent area is predominantly Malay. In between, the youths with their tall spiky hair and leather jackets stand out as their patronise the local eateries. “At first they would feel uncomfortable or even frightened by these ‘aliens’. But we approach them and sometimes they have a problem, so we would offer to help them. The punk movement started out as a subculture in the 1970’s music scene, using their flamboyant and eccentric styles as a way to oppose the values of mainstream society. For Ashed, 26, it was less the fashion but the attitude which led him to Rumah Api’s doors. He wishes, above all, that people would understand punks better. He said punks are not a group living in its own world, but instead are concerned about the downtrodden and hopes that through community service, it can help these oppressed people. 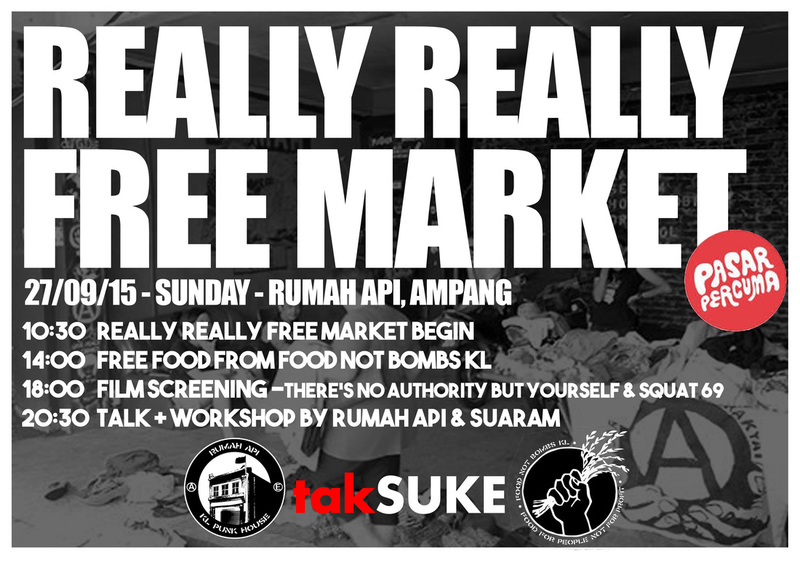 ‘Food Not Bombs’ is one of Rumah Api’s community service initiative. Every weekend, Ashed and other punk youths would bring a shopping cart to the Ampang market to collect food items that the traders were unable to sell or are about to throw away, to be cooked and distributed to the homeless and the poor. But even this straightforward noble cause was wrongly portrayed with a local TV channel broadcasting a reporting claiming “skinheads eat garbage”, he said. “At first when we sifted through the garbage bins at the Ampang market, the locals asked us what we were doing and whether we’re looking for food because we couldn’t afford to pay for it. “We told them that we want to cook the food for the poor and the homeless. So the traders said, ‘This is excellent. Next time don’t look through the garbage anymore. Come to our stalls and we will give you the ingredients’,” Man said. Since then, this group of youths would show up at the market and go stall-to-stall just before they close to collect the unwanted food, and never fail to return with a full load in their trolley. 20 Sept – A small act of solidarity from London for Rumah Api (KL): Banner drop outside the Malaysian Embassy on the same day as a massive ‘Malaysia Night’ event takes place in nearby Trafalgar Square. 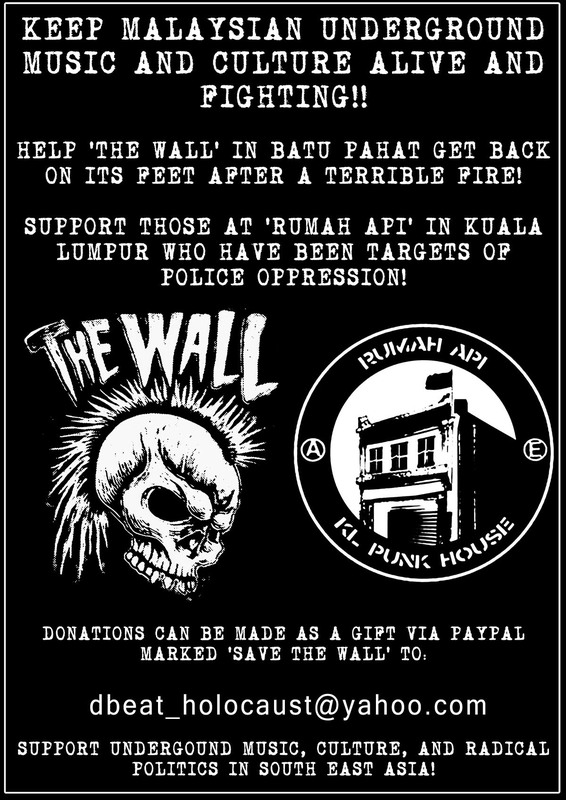 Rumah Api is a Kuala Lumpur based anarcho-punk social centre and gig space, and was raided by armed police on August 28th. This resulted in 160 people being arrested. On 28th August (Friday), over dozen police with automatic weapons and K-9 unit attack Rumah Api (social center/house project in Kuala Lumpur) during concert on that night. The police raid the house project and raid everybody during the concert and also trash into living room of people who live there without any warrant and solid reason of the raid. We all believe the raid were conducted due to the connection of Bersih 4 Rally which happen on the next days (29 and 30th) in which totally insane since the organizer of the concert, participants, and Rumah Api have little interest to join or even support the rally, due to our political stance on the issue of election and voting system. The state use Rumah Api as the scapegoat of recent event of attack on banks and multinational corporations in KL for the past 2 years. So far, they found nothing to link us with that events. The police seize all the musical equipments at the concert hall, seize 2 computers of people who live there, one smart phone, artwork, and books belongs to people who live there. The police said they search the building for any weapons or explosives that can link us to terrorism. All 160 people who got arrested were remand for 3 days. Among of the arrestee, there are friends from United States, Germany, Spain, Phillipines and Indonesia who attend the concert. According to the detainees, during the interrogation, the police ask about their participation with Rumah Api and how far the knowledge they had about Rumah Api and terrorism. They all been given little food and source of water and there are issue of mistreating the detainees, especially womyn detainees. The police released all of the detainess on 31st August except two friends, one for Manila and one from Bandung. The police mention that they still under detention due to the process of checking their status in Malaysia and both of friends have records that they are entering this country with legal permit. At the moment, they still held the computers and a smartphone until further notice to help their investigation. 2 friends were now facing court charges of Section 143 of the Penal Code, Section (4)(1)(b) of the Sedition Act and Section 6 of the Selangor Entertainment and Places of Entertainment Enactment which facing fine and prison sentence of 20 years. We asking for solidarity from all over the world to spread the news. This is a brutal tactic use by the state to clamp down the movement. With current political and economic unstable in this country, and also the uprising of the anti-government sentiments, they trying to put down any action or any lifestyle that doesnt go along with what they want. On Rumah Api side, the gig that night titled is Party Tonight, Revolution Tomorrow is nothing more than just a normal friday night gig with no intention to relate it with Bersih 4 rally. We at Rumah Api are hypocritical with the popular struggle in Malaysia. Bersih 4 which is a demonstration for free and clean election is a so called first world problem and it is a middle upper class agenda. Bersih 4 is being supported and joined by liberals and Islamist with their partisan politics that we are all against. We focus more on the grassroot level and more interested to put our energy on strengthening our own and surrounding community. We see, by supporting Bersih 4 and it’s agenda, we are on the wrong side of our struggle. In Malaysia, by changing the government, it will not make the problems goes away. Issues of xenophobia, homophobia, racism and religion are still the serious problems the politicians failed to address. Now, people still gathering outside of Ampang Police Station to pressure them to released two of our friends. Please spread the words and reply if you need more infos, updates and so on. 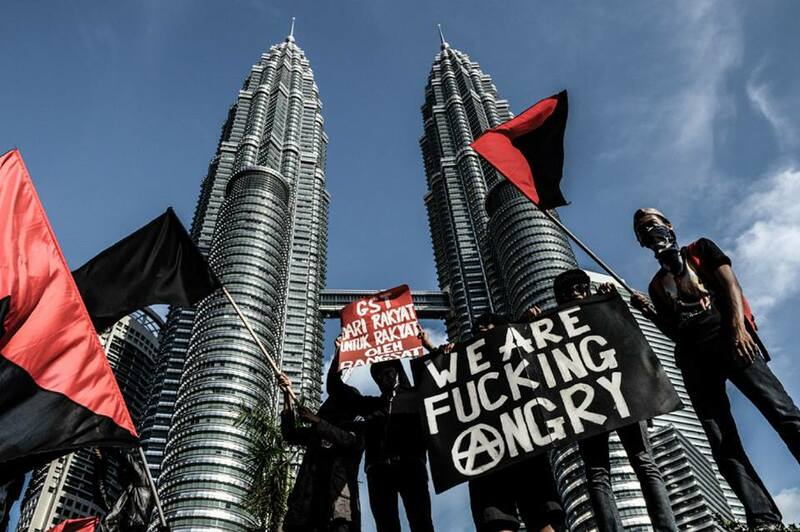 26 May – Police in Malaysia have launched a witch hunt for two anarchists who they are accusing of being the ‘masterminds’ of the anarchist May Day demonstration in Kuala Lumpur during which a bank window was smashed by rocks and the bank’s security guard was slightly injured. Police are alleging they found a bag left behind at the bank that led them to a 30 year old factory worker from Shah Alam. 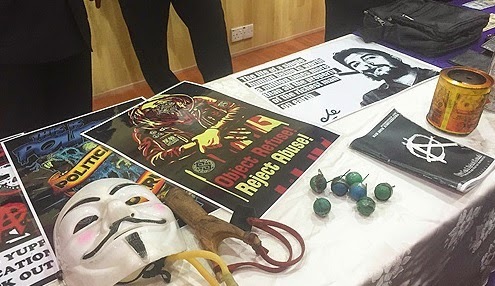 The worker’s house was raided on May 2nd and a number of items were seized including posters, a Guy Fawkes / Anonymous mask, pamphlets, a slingshot and some smoke bombs. 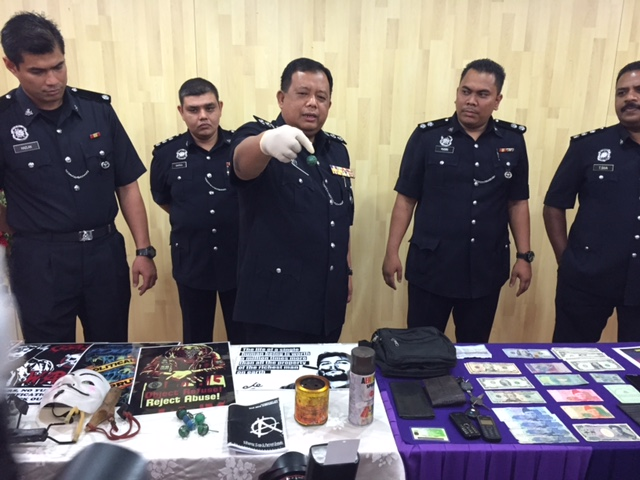 Police held a press conference on May 26th with the seized items on display and released photos of two anarchists named Markio and Ocha who they say they now want to arrest and charge under Section 148 and Section 4 (using corrosive or explosive substances or offensive weapons) of the Malaysian criminal code. Of course the scum press in Malaysia happily obliged the police by immediately broadcasting their photos and issuing ‘news reports’ that just repeated everything the police said word for word. Solidarity With The Wanted Comrades Markio And Ocha! Solidarity With The Malaysian Anarchist Movement! Interview with Arip, who runs, with four other people, the Pustaka Semesta infoshop (Pustaka Semesta means something like « universal library »), in Rumah Api (means « lighthouse » and « uprising house »), Ampang, KL. Interview made in Kuala-Lumpur on March 28th, 2012, sent to Disaccords by a traveller. What is Rumah Api ? Besides the infoshop, what activities can we find here ? Rumah Api is a rented two-story building, it’s a shop-lot. Upstairs we have the infoshop, and on the ground floor we have two rooms, one for concerts, gigs and everything (screenings, discussions, etc. ), and one for kitchen used by Food Not Bombs. Some people do live here as well, right ?